Recently was my birthday and one of the presents I’ve get was 2 bottles of whiskey, while one of them was fine for me I didn’t like too much the other one so I’ve started to think about recipes to use this whiskey, and tried this one. Easy and full of taste, and as a bonus a good choice for carry on a tupper. Nice! 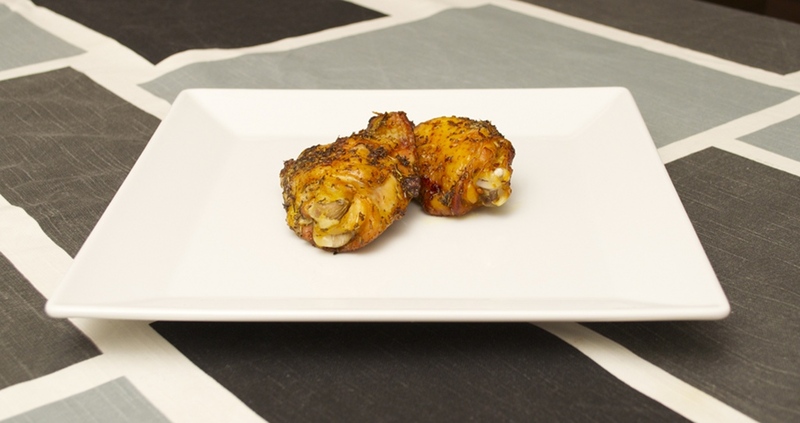 Place the chicken pieces on a tray suitable for oven and make some incisions with a knife on the chicken. This will allow all the juices penetrate inside the chicken making it more tasty. Then add salt and ground pepper on each side of chicken pieces. Add also some soy sauce, rosemary, thyme, about 5 garlic cloves previously broken with some hand bangs, the juice of half lemon a bit of olive oil and finally some whiskey. If you want some garnish, you can also add onion, potatoes, pepper, your favorite choice. Let rest one night on the fridge. Next day take your oven to 350ºF (180ºC) and cook the chicken for one hour. I placed the chicken on a grill tray and under the chicken the tray with all the juices, you can flip the chicken pieces several times and carefully irrigate the chicken with the sauce. Focaccia is a typical bread in Italy served on a lot of places like a kind of fast food. At the end is similar to the pizza but using a thicker dough and less ingredients above than on a pizza. With this recipe it is really easy to prepare a tasty focaccia because there is no need to knead the dough, just mix with a wooden spoon or spatula. First step is to weight the flour on the mold you will use later to bake the focaccia. Just cover the mold taking the flour a maximum height of about 1 to 2 centimetres (like 1 finger). Then prepare a mix of 10% of olive oil with basil, oregano, rosemary and one garlic clove. I used a mix of olive oil and olive oil from a tin of dried tomatoes giving a nicer taste to focaccia. Process it with a mixer. Add the flour on a big bowl, then add 1% of baker’s yeast (you will use double if it’s fresh baker’s yeast and will add later dissolved in water), mix well, add 2% of salt and mix again. Add the mix of olive oil and spices, reserving a small amount. Finally add 70% of warm water. 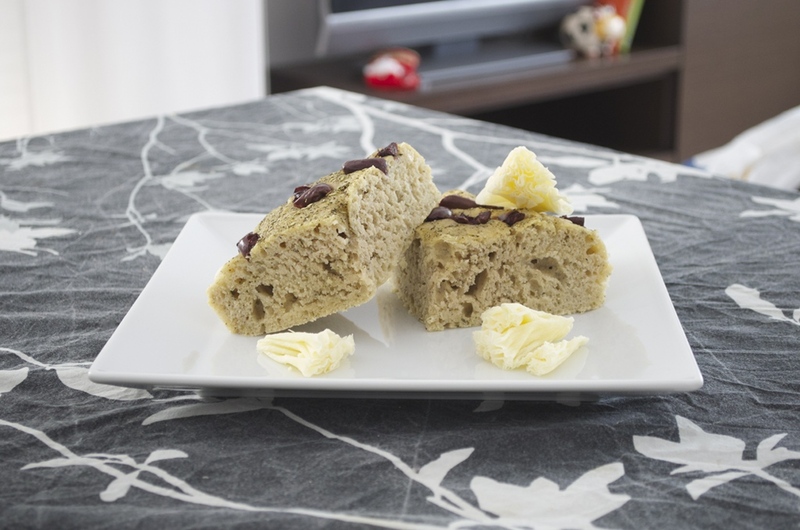 Now just mix well the ingredients with a wooden spoon or spatula without the need of kneading which makes this recipe easier. Cover with transparent film and let rest for 1 or 2 days. After resting give it a litte mix just to remove the gas formed during the fermentation. Paint the mold with a bit of olive oil painting the base and also the walls. Add the dough on the mold, trying to distribute all over the mold, cover with a cloth and let rest for 3-4 hours. Then paint over the focaccia with the reserved oil and spices mix, make holes over the focaccia with a finger and if you want throw some ingredients above like for example I did with kalamata olives, you can also use onion cut on to stripes or a winner combination like tomato and fresh basil. Finally bake on the oven at 390º F (200º C) for about 20 minutes, and you have your focaccia ready. This is for me a top recipe, it is easy, requires you near no time, it’s delicious, tender and juicy. Let’s start putting the chicken on a food bag, and lets add salt, rosemary, thyme, a bit of soy sauce, a bit of olive oil, 4 or 5 garlic cloves crushed with your hands, 2 onions cut in about 10 pieces and finally cover all with white wine, do your best to close the food bag and let rest for one night in the fridge. Next day place the chicken on an oven recipient, better with the skin on the up side and cook in the oven at 350ºF (180º C) for 90 minutes. Tuna is a very common fish I eat, but normally in can, and it’s a pity because you can get really nice recipes with tuna, like this provenzal tuna, taken from a Gordon Ramsay’s book . Hi to prepare this provenzal tuna start chopping one red onion or 2 if they are small, if you don’t find red onion just use a regular onion. Remove the tails of a red pepper and yellow pepper and cut them into small pieces. Cut the ends of a zucchini and then cut it longitudinally, and cut again longitudinally each piece, finally cut in small cubes. Preheat oven at 400ºF (200ºC). Add olive oil in a pan, and when oil is hot add the onion, peppers, a bit of salt and 4 crushed garlic cloves, cook them for 5-6 minutes moving to avoid them to get stuck to the pan. Add zucchini and cook for 3 minutes more. Finally add 50 gr of black olives without bone (about 20), some chopped rosemary and thyme and a can of crushed tomatoes. Add some salt and cook for 10 minutes moving frequently. Add salt and ground black pepper to tuna loins. 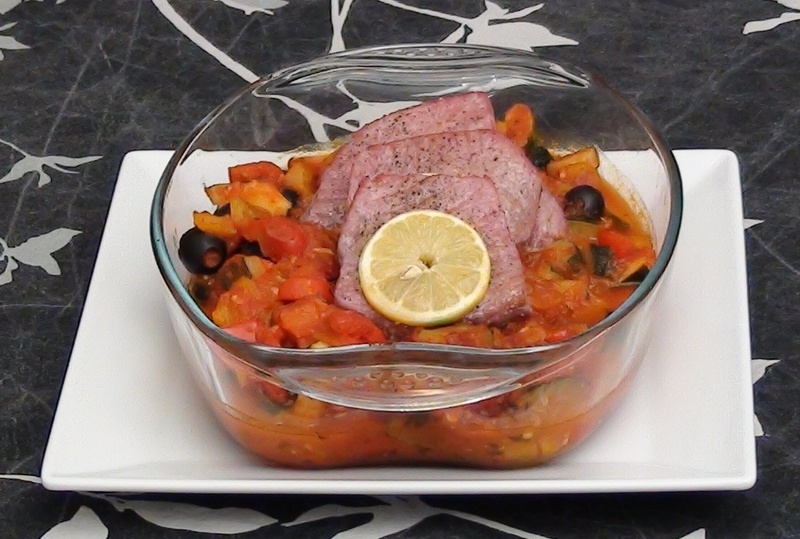 Put the vegetables on a baking tray, and dispose tuna loins over them with a slice of lemon over each piece of tuna. Add olive oil and cook in the oven at 400ºF for 10 minutes, some more minutes if you prefer tuna more cooked. Finally if you don’t eat all the vegetables, just reserve them and use them to dress boiled brocoli, will turn brocoli simply delicious! 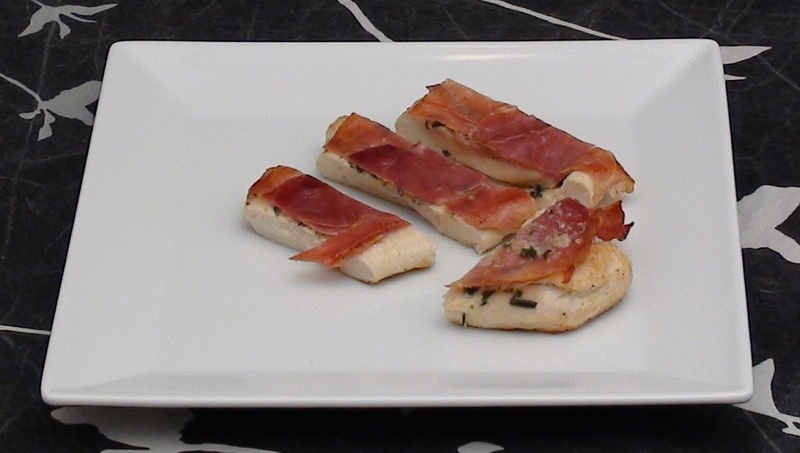 Put a chicken breast over transparent film, add salt, rosemary and thyme, grate a bit of lemon skin, cover with grated parmesan cheese, and finally cover with 2 ham rashers. Wrap with the film and bash with a pan. Doing this the chicken breast will have an uniform thicknes to cook better, and will absorve the spices to taste better. Add olive oil to pan, and when oil is hot add the chicken breast with the ham side down, add salt and pepper. And cook for 7-8 minutes turning chicken breast several times. Peel the prawns and place the heads and skin on a big pot, add also one onion in quarters, 2 carrots, thyme, rosemary, 5 garlic cloves, 5 small radishes and 2 sepia. Add salt and olive oil, cover with cold water and let boil for about an hour. On this way you will obtain a nice broth and the cuddlefish will be tender. You can also add more vegetables to the broth, like pumpkin, celery, leek … the more ingredients the more taste. Once the water has been boiling for an hour remove the sepia and drain to obtain the broth. Chop one onion. Add 3 garlic cloves on a blender cup, olive oil and parley and mix with the blender. Add this oil to a pan. When oil is hot add chopped onion, salt and move it; cook it for about 10 minutes. Then add the muscles (discarding those already open, because should be unhealthy), add also sepia cut in small pieces and the peeled prawns. Move frequently and cook until almost all muscles are open. Add the rice, the saffron and mix it well. Now add broth to cook the rice, the rice must be cooking for 15 minutes until it gets tender. Add broth more times if needed; also taste it to check if you need to add more salt. You can server some lemon with it so people can squeeze it; lemon it’s a nice partner for paella. 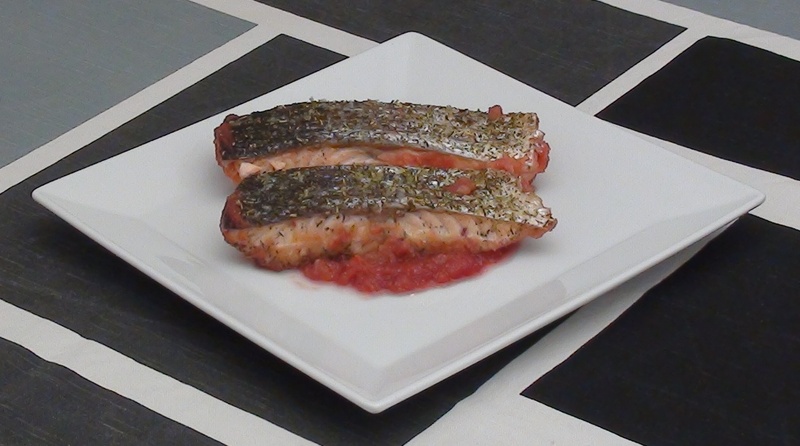 I’ve learn this recipe from Jamie Oliver’s videos, it’s an amazing recipe to prepare the salmon easily and quick with a really nice crispy touch. If you don’t like food too spicy just remove the chili from the ingredients list. In first place we will prepare the sauce, to do so add in a blender cup one red onion cut un quarters, one chile, 3 garlice cloves, ginger (about the size of a thumb), 5 small radishes, soy sauce and the juice of a lemon. Mix it well. Make an incision in the salmon loin, make sure the sharp is really sharp. This will allow to get the spices better distributed on the salmon and also get more uniformly cooked. Even could be nice looking. Over the salmon drop some rock salt, thyme, rosemary and olive oil. Slap with the salmon with your hands so all the spices get stuck. On an oven tray put the mix already prepared, place the salmon loins with the skin above. 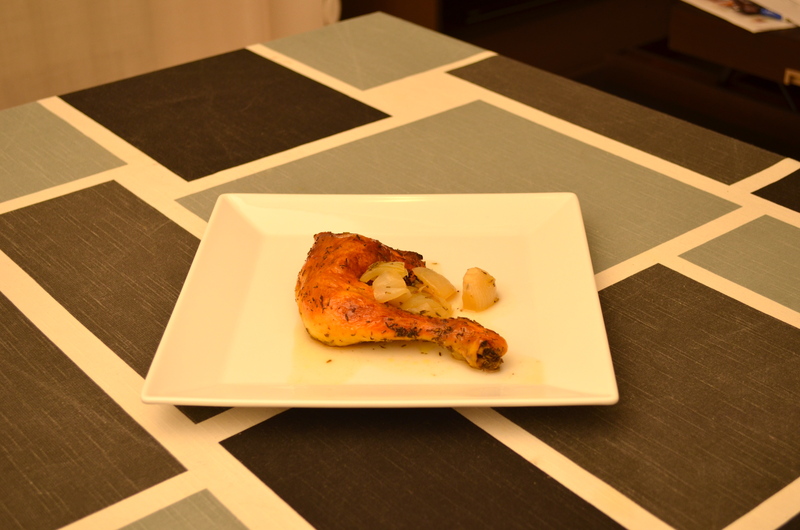 Cook in the oven at 420ºF (220ºC) for 20 minutes and you have this recipe ready. Having the skin exposed will make it nicely crisp.